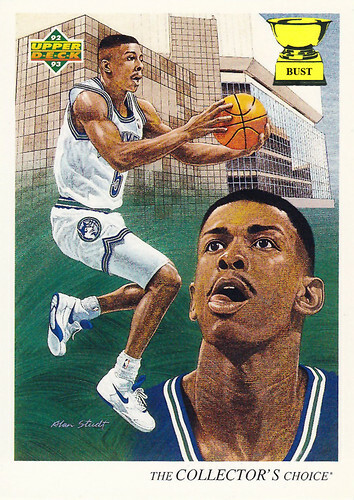 Welcome to Basketball Art Week: As the NCAA swings into action this week, our attention turns back to atrocious basketball cards. Sure, action shots are nice and studio shots are even better, but here at The Bust, there's nothing we like more than a good illustration. In the absence of that, we will be bringing you a week's worth of laughable illustrations from the early 1990s. Try not to go blind the next seven days. Behind the canvas: Art collectors of the world, you'll want to pay attention. Before you start the auction for this piece that could range up into the tens of cents, there are a few things you should know. Doug West was a fine basketball player, sure. But he was an exceptional architect. Behind him is the philosophy-bending, post-postmodern home he designed for himself. It features six bedrooms, five bathrooms, 12 barbershops and a spandex factory. Yes, West was a spandex fanatic. He created the world's first spandex neck warmer, which, as this fine piece shows, had to be quite long. Depicting West's neck in such a way was the brainchild of artist Alan Studt, a part-time roofer. Studt had trouble getting West to pose with any semblance of emotion for this piece. Then, an idea sprung forth. The artist held up a pastrami sandwich, which brought about the face you see above. Now, art collectors, let the bidding begin. Do I hear 1 cent? One cent? A half-cent? Lint? Do I hear "lint"? Hmm. Funny that he got paid thousands of dollars to do this artwork. What did you get? Nothing. That's right. Get a life rather than tell lies about an extremely talented man. Part time roofer. Not true. Go take a look at all of his other artwork. Actually, I'd like to see how great of an artist you are. Try to paint something that comes close to his greatness and detail and post that, then we'll see how great of a critic you are. Really - Those that can ... do, those that can't ... nit-pick & criticize - get a life baseballcardbust.com.